Hyundai Pick Up Truck For U.S. Market! It's Confirmed! - Muscle Cars Zone! Hyundai Pick Up Truck For U.S. Market! It’s Confirmed! Hyundai Motor Company finally has decided to move to the needs of the families who live in the suburbs, they confirm to Reuters they will enter into the pickups world. They will finally start production of the first Hyundai Pick Up Truck for the US market. By coincidence at the same time Kelley Blue Book announced that the Millennials from US are buying more and more vehicles from the SUV segment. Back in the 2015 Hyundai Motor Company unveiled their crossover truck concept Santa Cruz at the Detroit Auto Show. 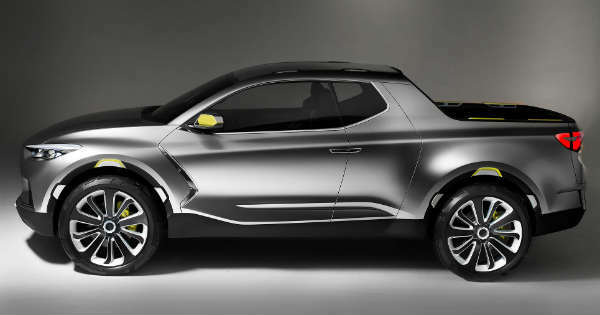 It’s believed that Hyundai ‘s new pick up truck will be based on their Santa Cruz concept. It was expected they will unveil their new pick up truck in 2020, but probably they decided to make its debut again at the Detroit Auto Show. Korean car maker will probably make their instant splash at the best car show in the US, market “owned” by Ford, Chevrolet and Dodge in regards to the pick up truck segment.